In the spring of 1964 troubled teenager Cookie Blue dies in the Red River. Cookie’s younger brother, Danny holds Miss Hartley, her despised gym teacher, responsible. 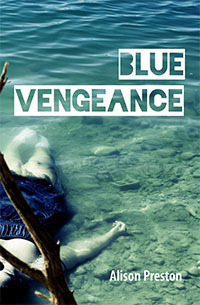 Blue Vengeance follows Danny through a Winnipeg summer and fall, as he secretly plots to kill her with a well-chosen stone and a slingshot. Janine Sénécal, a girl who had been Cookie’s friend, and who harbours her share of secrets, insinuates herself into his plans as his accomplice. The connection between Danny and Janine is complicated by his growing love for her, and her fascination with an older boy, Rock Sand, who has his own secret that links him to their deadly scheme. Danny’s father is long gone, and his mother suffers from debilitating fatigue and pain – symptoms of fibrositis. In some ways their roles are reversed as he takes over the meal-making and other chores. But the illness and her self-medicated state free Danny from certain restraints traditionally put upon a young teenager by a parent. Purchase print book from Signature Editions, Amazon or Chapters/Indigo. Purchase ebook from Signature Editions, Amazon, iTunes, or Kobo.